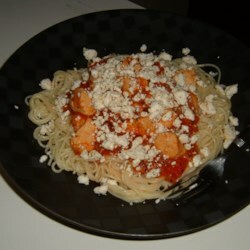 Angel hair pasta is tossed with chicken and roma tomatoes in this simple but flavorful dish. The spicy blackened meat seasoning combines well with the crumbled feta cheese. Easy, but great for a company dinner!